An outdoor hammock chair is a great way to unwind and relax while enjoying the crisp air and natural sounds of nature. There are many outdoor places that a hammock chair can be hung if you use a little creativity. You also do not need to be limited by the outdoor surroundings. To help you get started planning your next hanging chair experience, here are the 7 best spots to hang a hammock chair outdoors. 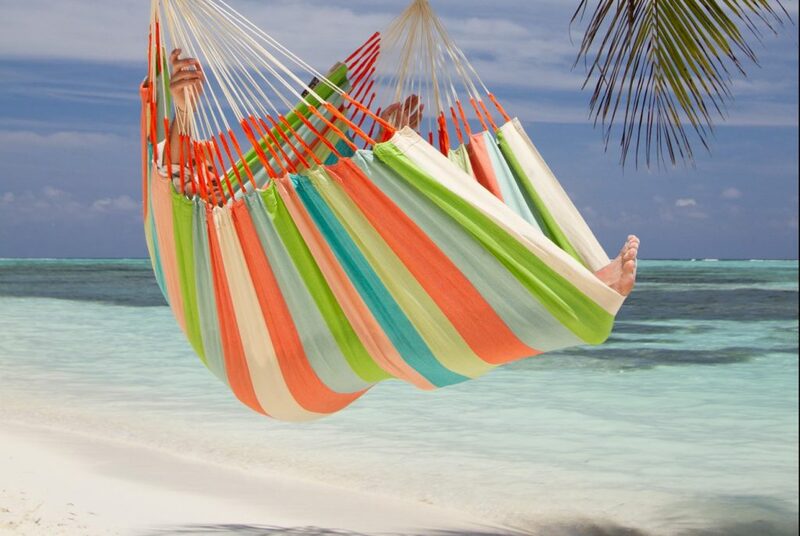 There is no better way to relax than to be soothed with the back and forth movement of a hanging hammock chair while tiny waves of water lap underneath you. A true Zen experience. This can be accomplished by finding a pair of trees that are across a river, lake, or ocean. Sometimes you will not be lucky enough to find a good location right over the water, but being directly next to it is the next best thing. Why not bring a fishing rod along as well and see what you can catch? The options are almost endless when you have a fresh water source and a hammock chair. You might not live in a state with a beach or have access to any other source of fresh water. 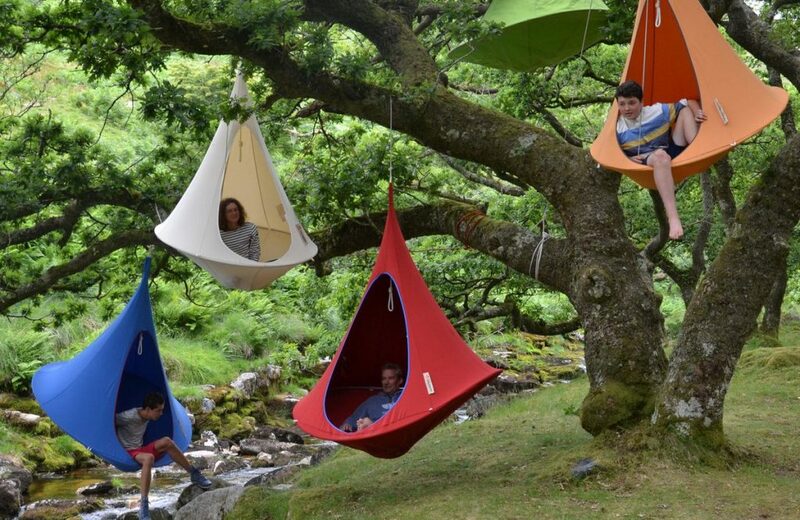 It also might be difficult to find just the right spot at these locations to hang a hammock chair. However, if you are a pool owner you can have the next best thing. All that you need is a sturdy tree branch or a hammock chair stand and you are ready to go. When you are swinging by the pool it is a relaxing way to enjoy a good book, have a nice glass of wine, or supervise your kid’s water activities. This one is a lot more common but still an excellent choice. An outdoor hammock chair is a great alternative to regular patio chairs or even a porch swing. In fact, some people say that no porch or deck is complete without a swinging hammock chair. With such a great opportunity for relaxation, why limit yourself to just one? More hanging hammock chairs hanging on your porch provide an opportunity for your entire family to have a relaxing experience. You might even find that you become very popular with the neighbors or other people in your community. Not everyone owns a garden or has a porch or deck. Some people live in a busy city in large buildings. If this is you, then you might think that there is no way you can enjoy an outdoor hammock experience. You should think again. Even if you live in a tiny urban apartment the opportunity to enjoy a hammock chair outside your home is within your reach. A fire escape is a great location to hang a hammock chair and enjoy the outdoors. You will be the envy of your building until they steal your idea and buy a hammock chair of their own. Just make sure that you check with all of your local laws first, as well as your building manager if you think that there might be an issue. Why not take a nap or read the paper at the park in a cozy hanging chair? Any park can be a great location for an outdoor hammock chair. To hang it you can use sturdy tree branches and suspension sets, or the stand mentioned earlier. It is a great way to unwind. The only drawback is all the people who will probably approach you asking where they can get a hammock chair of their own. It is up to you if you want to exit your cozy hammock paradise and let them give it a try. When you are out camping there is no need to rough it on the hard ground or sit on a rock. Just bring your handy outdoor hammock chair along. There is no better way to take a break or even enjoy a nap. A hammock chair is an ideal camping accessory that just isn’t used enough. Hammock chairs are very versatile means of relaxation and with the right creative mind can be enjoyed in a variety of settings. The 6 listed above are just the tip of the iceberg. Speaking of ice, why not hang a hammock on your next ski trip!. With a hammock stand or the right trees and suspension sets, there is really no place that you can’t enjoy your hammock outdoors. 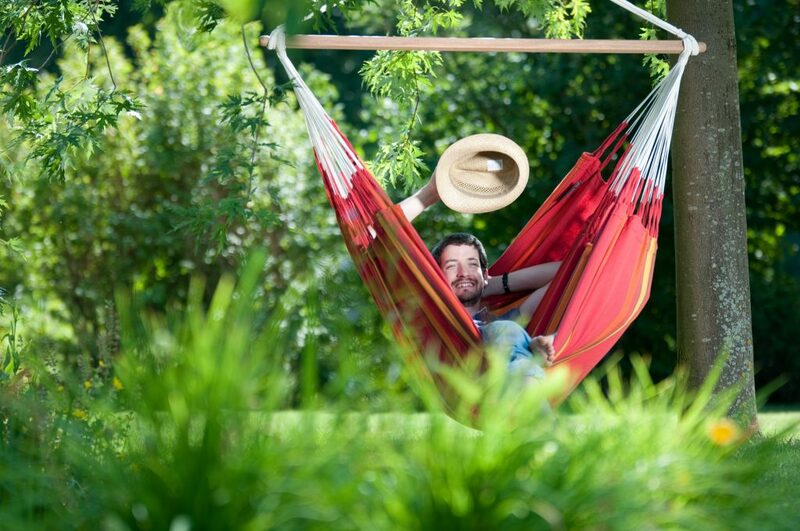 Don’t take our word for it, try one of our 7 best outdoor hammock chair locations or just create a perfect hang out! The Ultimate Hang Out- how to create it?